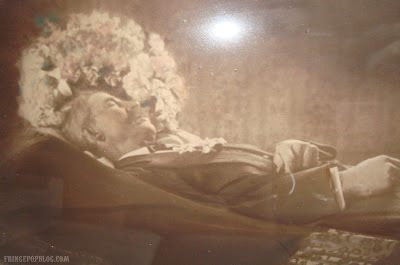 As I've mentioned, post-mortem photography subjects were most often children and infants. Sometimes, though, the subjects were deceased adults. 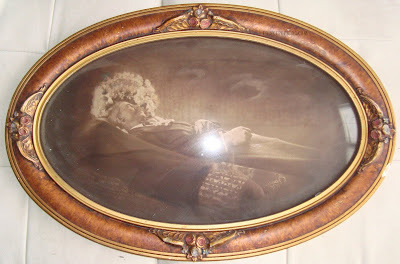 The item shown above is a turn-of-the-century post-mortem photograph of a deceased gentleman in convex bubble glass and frame. I found this memorial piece in a small antique shop near Green Bay, WI, and had to have it. Nothing is known in regards to the man's identity. When I find pieces like this, I often wonder how they wound up in a thrift store or antique shop. Was there not even one descendant of this man who could pass this down? I don't want children, but I would like to think there's someone in my family line that I could entrust to pass down a piece like this. It makes me sad that the piece isn't being cherished, but at the same time, I am happy that I have the piece and will care for it. Then again, who knows? Maybe this guy was a real prick.